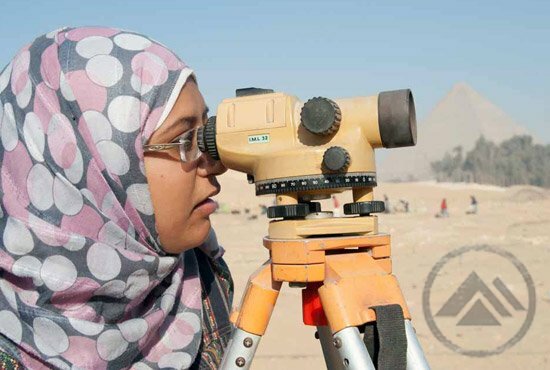 Even though I’ve been back home from Giza for over a week now, my work with the AERA geographic information system (GIS) isn’t over– it has just shifted into a new phase. 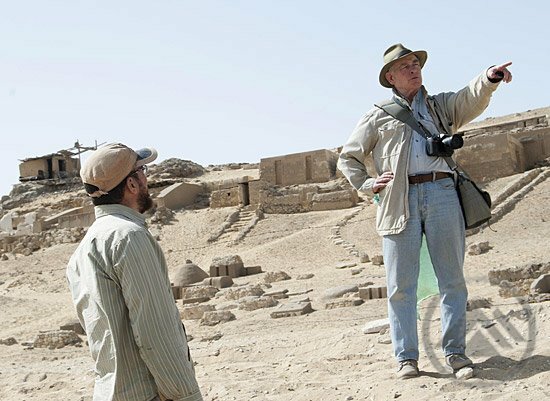 During the excavation season, my priority was the daily digitization of new features as they came out of the ground. Over 900 new archaeological features were digitized this season, which kept me very busy! I worked closely with the excavators and our archivist to make sure that all of this season’s data was properly recorded and to provide team members with a quick, accurate, and integrated visualization of the KKT & HeG sites. 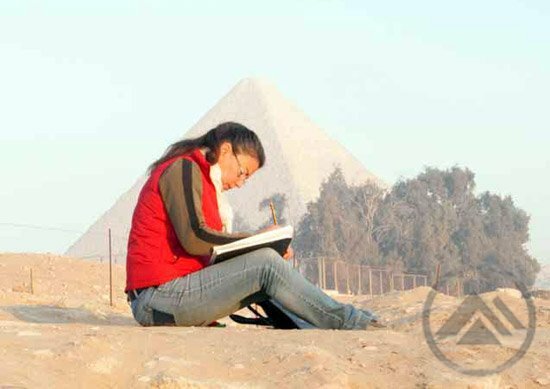 After a busy season of work on materials from four areas of the AERA excavations, the Giza lab is now winding down. The ceramicists have finished their recording and drawing, the objects are all registered, sketched, photographed and stored, the animal bones have been identified, and the sealings are all stored for future seasons. The work this season was conducted mainly by the SCA Inspectors, who have trained with the AERA/ARCE field schools and graduated through the advanced levels to become specialists, working alongside the international specialists. They have all been looking at the materials from the Gallery, Menkaure Valley temple and Khentkawes Valley temple – all very interesting, and there have been several special discoveries. 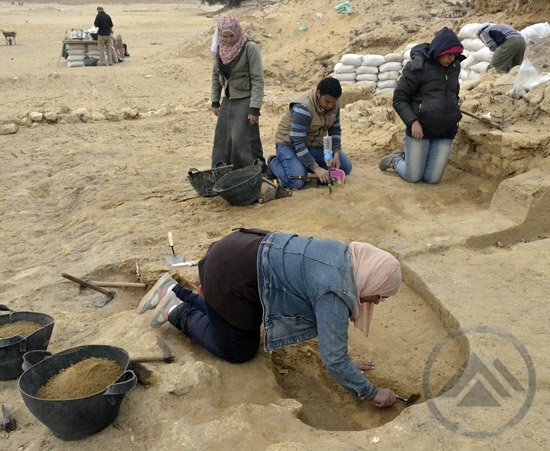 I was talking to Ahmed Ezz, one of the team members, about when I excavated Gallery III-4 at Madient Het el-Gourab when I realized that excavation was 10 years ago and no one excavated in the gallery complex until this year, 10 years later. One of my dreams was to excavate in these galleries again and I’m very pleased to be back to the galleries this season. Working in excavations requires you to be patient and record everything stratigraphically starting from modern to old. But working in trenches enables you to answer specific questions. 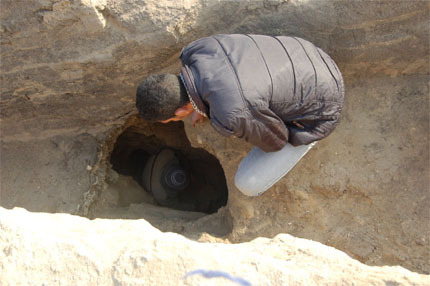 Sometimes archaeologists have to make “shofi holes”. 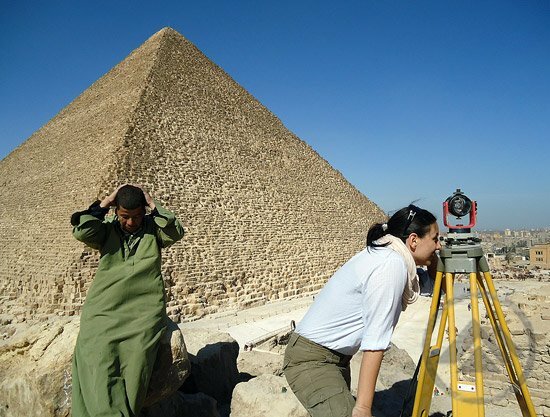 An interesting thing happened to me with my team members during our excavation in Trench G in Menkaure Valley Temple at Giza 2012. We were working behind one of the limestone core blocks that dates to Menkaure; suddenly we heard a loud yelp. It was one of our workers crying when he fell down into an unseen hole our excavations had uncovered. The depth of this hole was about 3 meters and 0.41 meters in diameter. Luckily, our worker was not hurt. The archeologists use the hole to read the stratigraphy and the limestone foundation of the temple as a shofi hole. This pit revealed to us the courses of lime stone core block. I was given the wonderful opportunity to return as a volunteer this year. I realized very quickly that only knowing a few words in Arabic from my last trip was not going to be enough this season. 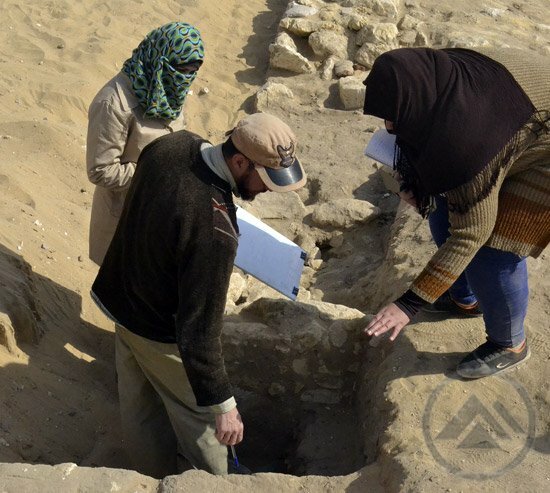 Archaeology itself is difficult but learning archaeology in Arabic is extremely challenging. I was fortunate to find two wonderful Egyptian archaeologists from the field school, Mohamed Elkhateeb and Hanan Mahmoud to give me lessons. I am slowly building my vocabulary. There are many different dialects. 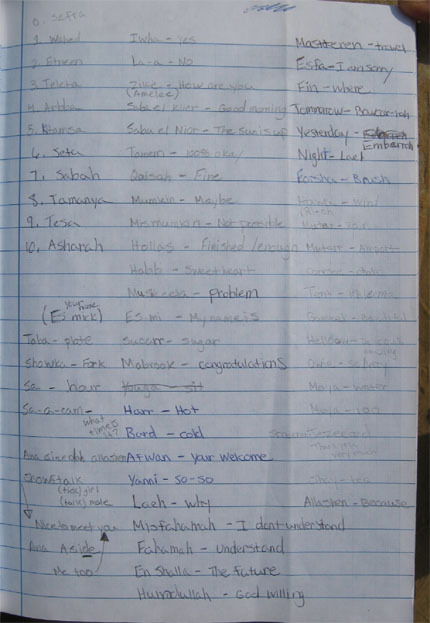 Mohamed and Hanan are teaching me what you would call their “slang”. I write down everything I learn in my notebook and Mohammad has graciously given up a few of his lunch breaks to “test” me on my progress. 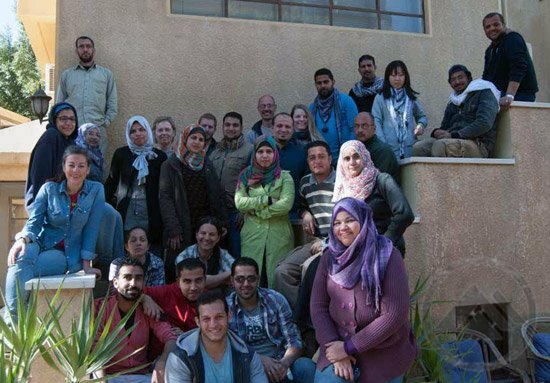 Learning Arabic is not required since everyone on the project speaks English, but I feel learning a language can teach you about the people and their cultural heritage. Egypt especially has such a rich history; you can learn so much by just having a conversation with an Egyptian. I am truly grateful for my teachers! Being an outsider and not being able to communicate with the people around you makes you feel very alone. I know English but I am Egyptian and my native language is Arabic. I was given the opportunity to go to London and work with the British Museum last year. This experience gave me the realization that a person who does not know English and visits London would experience a lot of loneliness. When I met Alex Jacobsen, I quickly realized, that she was an outsider. I felt that teaching her Arabic would change that. I did not want her to experience the feeling of loneliness that I associated with my trip to London. Being an archaeologist, you have to be able to communicate with workers, who cannot speak any English. Most importantly, some of the tools we use don’t have English names such as “Mukteef.” You must know these words to work on our sites. Modern life provides clues to the past. I started the 2012 season by cleaning the houses in the north side of the Khentkawes causeway in order to record them. We defined the walls, exterior and interior, that form the houses, we defined the earlier phase of usage of the houses and the later phase that witnessed the modifications and additions, which are represented in the blocking events and new dividing walls. But I found something that made me think about modern life in the villages. 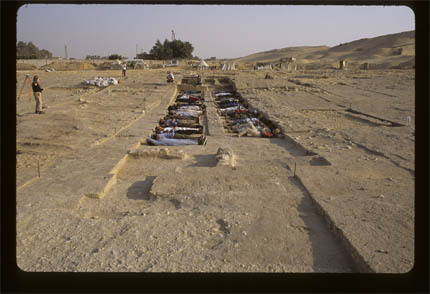 Gallery III.4 2002 (facing south) with the team testing the idea that the Gallery was accommodation for workers (photo by Mark Lehner). This is an exciting idea and one of our aims this season is to see whether we can find evidence to support this view. We also want to gain information on how these structures were built and the changes they went through during the time they were used. 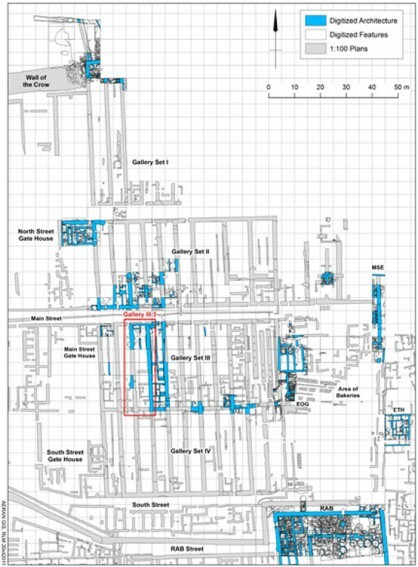 This is an important part of our work because although AERA’s map of the Complex (see below) appears to show that the galleries were built according to a standard plan there are variations in size and internal layout. Map of the main site Heit el-Ghurab. 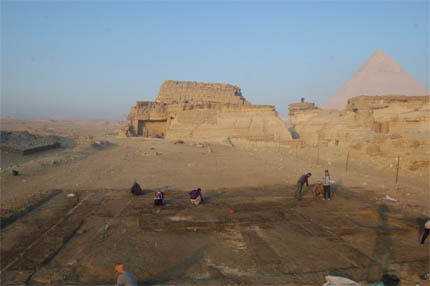 With the New Year we open a new excavation season in Giza. We have been preparing for weeks: equipment, archives, travel, and housing. 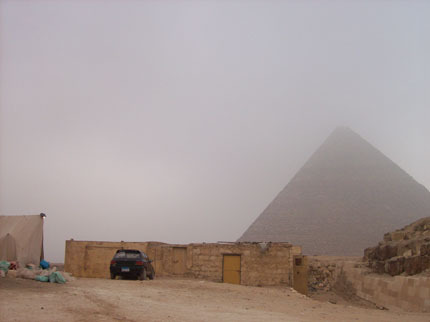 Traditionally, we started on site soon after the Coptic Christmas Holiday on 7th of January. We spent a week removing the protective sand we had left at the end of our previous seasons from four excavation areas in readiness for the team. Saied Salah, our Reis (overseer of workmen), monitored and photographed the entire process, which ranges from removing modern thick, sand deposits, to light trowelling of delicate areas. 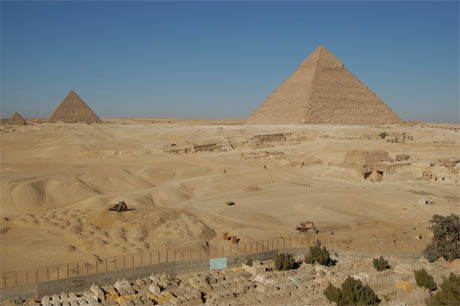 The Giza plateau viewed from the southern knoll, view to the northwest. 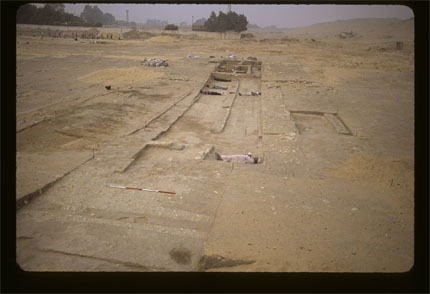 The Khentkawes and Menkaure Valley Temple excavation areas are on the bottom left beyond the modern cemetery and trees. Photo by Yasser Mahmoud.